Look at Egyptian people’s protesting against Barack Hussein Obama with signs, graffiti and in audio and video interviews. The average Egyptian person on the street knows about Obama! Why don’t Americans??? See the Davos World Economic Forum link where this post was based on. Even the socialists tell you that – it is a bad thing. Well, fortunately, Obama was not quite successful, however, the idiotic punks of America, the liberal/Democratic Party, where the New Yorkers just elected a female 18 year old hispanic communist in their mid-term election. Maybe, she’ll be lucky and convert the American people. REALLY? I DOUBT IT. I’D RATHER BELIEVE THAT A CIVIL WAR WOULD BREAK OUT. Thanks for following my UTLOT blog; you are very kind. Please, be sure to check out its pages. May you have a wonderful day. Ruskies criticizing socialism sound just like mafia condemning CRIME! What you said makes sense to me, but he did actually say this to Obama at least 3 times, and the Chinese did so once, Publicly. If it doesn’t work let us know and we will find you a new link. I believe both Russia and Chinese criticisms were self serving. Both were (are) heavily invested in our American Capitalism. For the most part for their own countries they want an all powerful Socialist central government that give the rulers absolute power. Please read Grumpy Old Man’s comment below for more info. Thanks for following my blog Bob’s Opinion, I appreciate it I look forward to reading your articles and comments. Demonic Party/Obama their carnage & collateral damage is not done by being idiots, it is a much bigger picture…in reality it is by design! First of all thank you for commenting. If you read Putins speeches in their entirety you will find that, in a Diplomatic-Speak way, he DID SAY THIS and quite strongly. You did read this article didn’t you? Also if you read the comments at the bottom there are further quotes and links. Those are from ed, our Adminstrator, who researched the speeches. The condemnation of Obama was stated in Putin’s 3 speeches and the fourth time with China’s Wen Jiabao. The following excerpts were copied from our original comment at the bottom of the article. “…The second possible mistake would be excessive interference into the economic life of the country. And the absolute faith into the _all-mightiness of the state_. 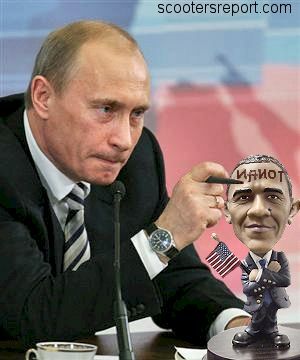 And there is more of Putin is laying it thick on Obama. Read all of the references and links in my original comment. Remember the above was said in JAN 28 2009!!! Obama hadn’t been in office long and the WORLD ALREADY KNEW what us AMERICAN PEOPLE DIDN’T WANT TO BELIEVE! That Obama was driving America and Americans into the pit! There’s an old saying “Many a truth is spoken in jest”. Even though this article is satire it spoke the TRUTH! I’m glad I was able to help you, and others reading this, today. FYI. Your link has nothing to do with these speeches at the Davos World Economic Forum in January 2009.